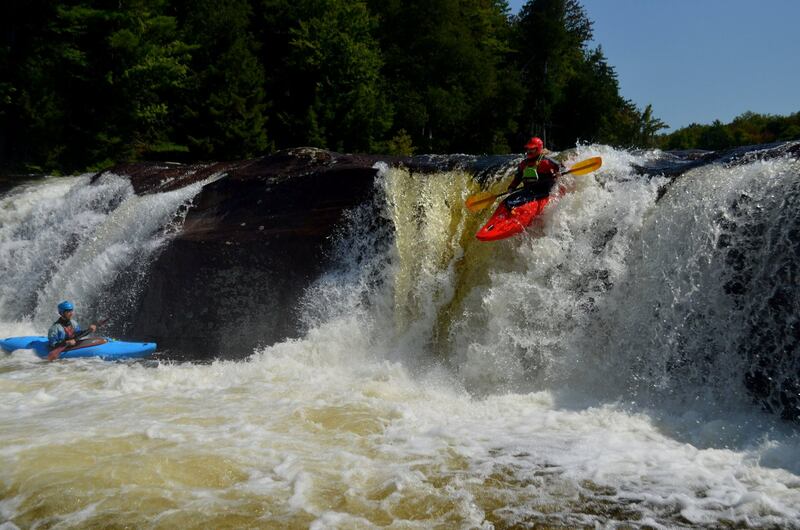 On Sunday May 20th, 2007 family, friends, and paddlers gathered to honor the memory and dedicate Emerson Put In at Limington Rips on the Saco River in Limington Maine. John Emerson was a well liked and respected paddler who shared an enthusiasm and love of the sport. Many paddlers attended his wedding to Brenda Surabian in the Fall of 2006. John died after a long battle with cancer on February 8th of 2007. In accordance with his and his families wishes a permanent right of way through the Emerson property to the upper Limington Rips was deeded and dedicated on Sunday. A monument with the plaque shown above is located at 11 River Rd, Limington, Maine (The River Rd on the west, upstream side of where the Saco goes under Rt 25. 3rd house on the right). John’s step daughter spoke of John’s wishes for this access point and hopes that all will enjoy for eternity but stressed this should be done with safety in mind. John also encouraged all paddlers to take a certified Swift Water Rescue course. After the dedication friends and family enjoyed listening to the bluegrass group called Southern Maine Pickin Society and a pot luck dinner.